I spent Saturday and Sunday exploring rural Pennsylvania in a persistent drizzle. 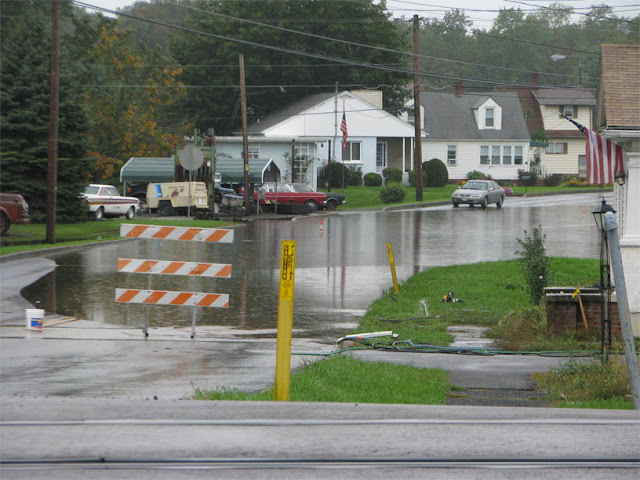 Apparently it had rained more heavily before; at two points in the main artery leading to Montandon, PA [across the river from Lewisburg, best known as the home of Bucknell University], the road had been flooded out. Meanwhile it's 11:20, and the post office closes at 11:30. The PO is still a half-mile away. What to do!? Well, I realized that if I took a side road a few hundred yards, I could get past that pesky sign. So, I parked the car just before the lake flooding the town's primary artery several inches deep, and trekked out along the curb the quarter-mile to get to the post office. Just in time! Good ol' New Yorker instincts come to the rescue again. Here's my trusty Camry waiting for me, in a telephoto taken in front of the PO. Here's the photogenic Montandon, PA Post Office, #8 of my Saturday. No, this post office is not on the RAOI study list, and will thus not be closed at the end of the year. Speaking of Lewisburg, PA, their post office shares its grand old home with the courthouse. (Omg! That's federal!... Naw, it's actually just county.) I was informed by a local that the building was just sold to Bucknell, and the post office might be moved. I can't otherwise verify this information.